The constant stream of reports and stories means it can be difficult to take a fresh breath and give yourself room for reflection. But looking back over a years-worth of news can be remarkably thought-provoking, and that’s exactly what New Years is for — contemplating the year that is about to end, and everything that happened which will undoubtedly affect the future that is right around the corner. With 2017 all but through, here are the Courier-Herald’s Top 10 news stories that made their mark on the Plateau community, through their unique (and often tragic) events and their ability to shape the future yet to come. An otherwise peaceful summer night in Enumclaw was disturbed when a plane flying over Rainier Trails Park crashed on July 27. The Enumclaw Fire Department had to extract the pilot from the plane, who was accompanied by his wife and another passenger. All three were sent to the hospital for treatment. The plane was reportedly practicing touch and go landings at the Enumclaw airport, which is located right across the street from the playground where the plane crashed. A preliminary report of the crash, compiled by the National Transportation Safety Board, notes the student pilot, on the final round of touch and go landings, “touched down at the departure end of the runway” and took off again, hitting the plane’s nose landing gear against a barbed wire fence, wrapping much of the wire around the plane. The report does not definitively conclude what caused the crash. The idea of a stormwater utility in Enumclaw has been bouncing around the City Council for years, but it never gained any traction until this year’s budget season. In 2015, the state’s Department of Ecology determined Enumclaw was not in compliance with accepted stormwater guidelines. “Nearly every city” in the state already had a stormwater utility in place, the DOE added. The City Council opted to not include the stormwater utility in the 2017 budget, but voted last November to implement one, likely by August 2018. The utility comes with monthly charges for residents and businesses. These rates haven’t been set, but a rate analysis arrived at a monthly cost of $4.38 per single-family home, while businesses would pay $4.38 for every 3,200 square feet of impervious surface. A big change is still in the works for Bonney Lake, what with the WSU forest being logged to make room for a new Costco building. The logging started March 27 and ended April 5, clearing out the 35 acres of forest next to the movie theater complex. 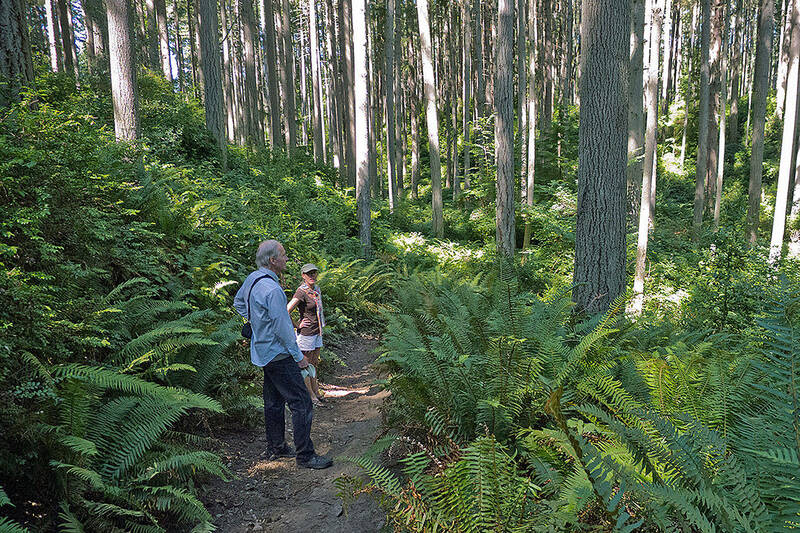 While the logging only took a little more than a week of work, the change was dramatic, and even though many community members exclaimed their excitement for Costco to be moving in, many more seemed disappointed with the decision to remove the forest. Construction on the Costco continues, with a tentative opening date of July 2018. Not all the changes in Bonney Lake this last year were controversial. Asking help from the community in early April, McKenna Sax, a senior at Annie Wright School in Tacoma, brought new life to the Bonney Lake Food Bank by repainting the decades-old building at the start of May. She hoped giving the food bank a new look would encourage more people to donate food or even volunteer like she did on-and-off for almost three years. Sax also got help from Bonney Lake’s Sherwin-Willaims, who provided the paint, and the Enumclaw Painting Company, which provided some professional painters to tackle jobs the dozen-or-so volunteers safely couldn’t. It wasn’t long into last year when the Plateau was hit with the most gruesome murder cases in recent history. While the murder happened in Tacoma, former Enumclaw resident Theresa Greenhalgh, 31, was one of the victims — she was a Enumclaw High School graduate of 2003. Greenhalgh and the other victim, Mary Buras, 21, were found in Tacoma Jan. 6 when the Tacoma Fire Department responded to a house fire. The two women were found beaten, decapitated and burned. Charges were brought against Matthew R. Leupold, 32, who admitted to killing the women — they were taking drugs together — after he started hearing voices. Leupold’s sister Lindsey was also charged with rendering criminal assistance for helping her brother clean up the home, and Leupold’s nephew was remanded to juvenile court, expecting to be charged with starting the fire. Black Diamond was a constant source of news this past year, but the biggest story could arguably be that the recall petition against Councilwoman Pat Pepper was approved by both the King County Superior Court and the state Supreme Court. King County Superior Court judge Beth Andrus approved four of the five charges brought against Pepper on May 10.
Pepper appealed Andrus’ decision to the state Supreme Court. On Oct. 26, the state Supreme Court approved three of the charges approved by the lower court. This recall effort is the fifth or sixth ever approved by the state court system — another recall effort against the Yakima County Clerk was approved by the Supreme Court the same day. If approved by voters, this will be the third recall effort to remove an elected official in state history. Two more former Enumclaw residents made the news this year when Kevin Jokumsen was arrested last August for the murder of his wife, Donna Mae Jokumsen, 30 years ago. After leaving Enumclaw in 1987, the Jokumsens moved to a Pheonix, Arizona suburb with their kids. In July, Donna Mae called her father saying she was coming back to Washington with the kids, but she never arrived. Donna Mae’s body was never found, and charges were never made. But in 2013, Arizona detectives reviewed the case and investigators concluded Jokumsen was responsible for his wife’s death. Jokumsen was arrested in Kent, where he was found to be homeless. Recently, Plateau resident Ron Shear proposed opening up a landscaping recycle center between Enumclaw and Buckley along Enumclaw-Franklin Road. The proposal has been opposed by the Green River Coalition, a non-profit conservation group. The group said in general, they opposed any recycle center being built next to the Bass Lake Complex, which feeds water into the Green River Gorge, but they were also concerned with Shear’s business history. Shear operated an illegal dump in Buckley in the mid-1990s, and the Pierce County Superior Court ordered the dump closed in 2003 after it was discovered Shear had no permits to operate the dump. Shear then moved his business to Auburn, where he fought two legal battles — one against King County when the County Council changed zoning laws, forcing Shear to relocate his business again, and another against Waste Action Project, who sued Shear for violating the federal Clean Water Act. The Waste Action Project lawsuit was eventually settled. King County is currently reviewing Shear’s proposal through the State Environmental Policy Act (SEPA) process. Just one vote can make a difference, as Luke Wilbanks of Buckley can tell you. Wilbanks ran for Buckley City Council Position No. 3 against Chuck Helmer in the November general election. When the votes were tallied, Wilbanks was ahead by one vote, 455 – 454. This triggered an automatic recount by hand, since the vote margin was less than one-fourth of 1 percent. King County Elections certified Wilbanks won the position Dec. 6. This wasn’t the only close race in Buckley — Mayor Pat Johnson was re-elected to her position with only 12 votes more than her challenger, Marvin Sundstrom. The Sumner-Bonney Lake School District announced Feb. 1 that, more than likely, the Sumner High School pool will be closed with the end of the 2017-2018 boys swim season. The pool has been a community establishment since the 1960s, existing as both a pool for student athletes and a community pool up until it became closed to the public August 2015. The district’s original plan was to close the pool in 2008, but then decided to keep it around for as long as possible. That time seemed to arrive when voters approved a $162 million bond proposal Feb. 2016, prompting the district to start looking for ways the school building (and parking space) can be expanded for more incoming students. The district has also said the pool’s boiler is on its last legs, and fixing the boiler would basically mean installing a new pool. The decision to close and eventually remove the pool was met with strong community resistance, who were concerned about the continuation of the Sumner and Bonney Lake swim teams. Sam Peterson, now a senior at Bonney Lake, took the 220-pound state title last year. Photo by Dennis Box. The Bonney Lake Panthers captured a state wrestling championship, proving themselves to be the best team in the Class 3A ranks. The title came Feb. 18 at Mat Classic, the state tournament held annually in the Tacoma Dome. The Panthers’ team victory was sparked by three individual championships. Taking titles in their weight classes were Brandon Kaylor, Sam Peterson and Brendon Chaowanapibool. Also contributing big were Mason Sabin, second place; Zach Koeller, third; Keegan Dorsey, fourth; and Ryan Shaffer, eighth. Success was nothing new for the Bonney Lake program, which had landed in the state tournament’s Top 10 every year since 2009. But it was the Panthers’ first team championship.